It seems like just yesterday when we opened our first location in Syracuse, and our entire team has been having a blast getting to know the locals. 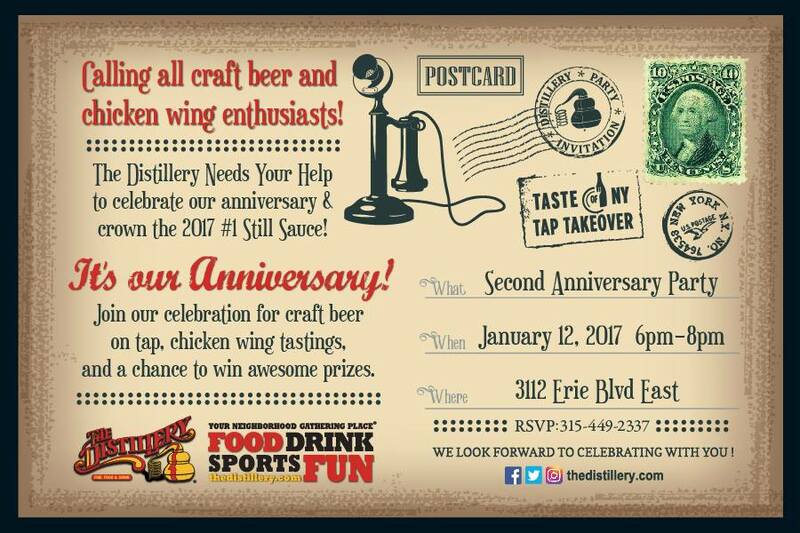 As a humble gesture of our appreciation and gratitude, we're inviting our new friends, neighbors and craft beer aficionados to join us this Thursday, January 12 to celebrate the 2nd Anniversary of DeWitt's Distillery in Syracuse NY. If you're a regular, this is definitely a can't-miss night with lots of goodies and giveaways. And if this is your first time, there couldn’t be a better opportunity to stop in, sample some craft beers and wings, win prizes and help us crown The Distillery's Best Sauce of 2017. We're letting Taste of NY takeover the tap, so be sure you're there to sample and enjoy 11 of the finest craft beers from across the state. Find one that you love? Order up a pint and let the fun times unfold! Since it's only fair that our guests have something to wash down the craft beer with, we'll be serving up mouthwatering wing samples with some of our restaurant's most famous sauces. Try them all and cast your vote to determine The Distillery's Best Sauce of 2017! Let's be honest here; few of life's jaunts are as fun as spinning a prize wheel after a few beers. Oh wait, there is something as fun… like winning free tickets to local sporting events! Give the wheel a spin for your chance at any number of fantastic goodies, or enter to win our drawings for Syracuse Basketball tickets, or tickets to an upcoming Crunch Hockey game. Our 2nd Anniversary celebration will run from 6:00 to 8:00 PM this Thursday, January 12th. So set the DVR, feed the pets, and get out for a couple hours to mingle with friends and interesting new strangers. DeWitt's Distillery Syracuse is located at 3112 Erie Blvd East, we can be reached at 315-449-2337 for additional information. See you this Thursday!